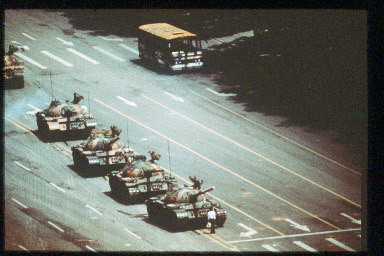 Wang Weilin, 19, stops a convoy of T69 tanks on the Avenue of Eternal Peace, coming from Tienanmen Square. At noon the column was stopped for minutes by the boy, later believed to have been arrested and executed. Stuart Franklin, "Wang Weilin Stops a Convoy," in POYi Archive, Item #18025, http://archive.poy.org/items/show/18025 (accessed April 18, 2019).